Do you have Office Communicator at work? Ever wonder how some of your colleagues get that little “note” icon beside their name that has some witty comment like “Working Hard”, ask “Leave me alone I have a tender to finish”, prostate or “Working from home today”? 1) Think of the note you want to use! There you go, now you can let your colleagues know what is going on. Think of it as your FaceBook status if FaceBook has been banned in your organisation! but you really want it to be white just like the slide! How can you turn this graphic design disaster around? make sure you click on it now. Talk about a quick win! Have you ever wanted to display what the current time was in a PowerPoint presentation. Not just the time you opened the presentation… but a real-time view of what the time is? 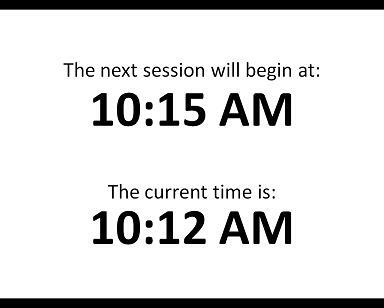 For example, doctor you might be putting together some slides for an event or business seminar, and you would like to display something at the start of the presentation that says when the session will start, and what the current time is (like the slide above). Well I thought it wasn’t possible… until today that is! It is actually really easy to do. But first you need to download an add-in for PowerPoint 2007. So that is the first part out of the way, setting up PowerPoint 2007 to display the current time. The next step is to enable the add-in. So what if you want to include the current time on every slide in PowerPoint 2007? If you want more detail on how to use the OfficeOne AutoDateTime 2.3 Add-in, check out the detailed instructions on the AutoDateTime website. So… you are sneaky. You have some precious data you want to keep hidden. Or your not so sneaky and just have some word documents that no one else should really see – for privacy or security or other reasons. Well it might be a good idea to use the encryption built into Office 2007. The encryption in Word, sickness Excel, viagra buy and PowerPoint 2007 basically turns your files into a mess that no one can read… unless they have the password. In fact unless you get the password right, visit this there is no chance you can even open the file. To encrypt your document in Word 2007, Excel 2007, or PowerPoint 2007, it is really easy! I can not stress enough that you need to remember what that password is… because if you forget it, there is no chance you will ever open that document again – it is strong encryption! Want to open a .ppt or .pptx file but don’t have PowerPoint?